One of the oldest distilleries in Scotland. Ben Nevis Distillery is nestled at the foot of Britain’s highest mountain, Ben Nevis, which has a summit elevation of 4’411 feet above sea level. This imposing mountain provides an impressive backdrop for the distillery. The principal ingredients of Scotch whisky are notably water, barley and yeast. Of these there can be no doubt that water is the most important and the distillery is unique and fortunate to have a constant and consistent source of pure clean water from two small lochans up on the mountain of Ben Nevis. 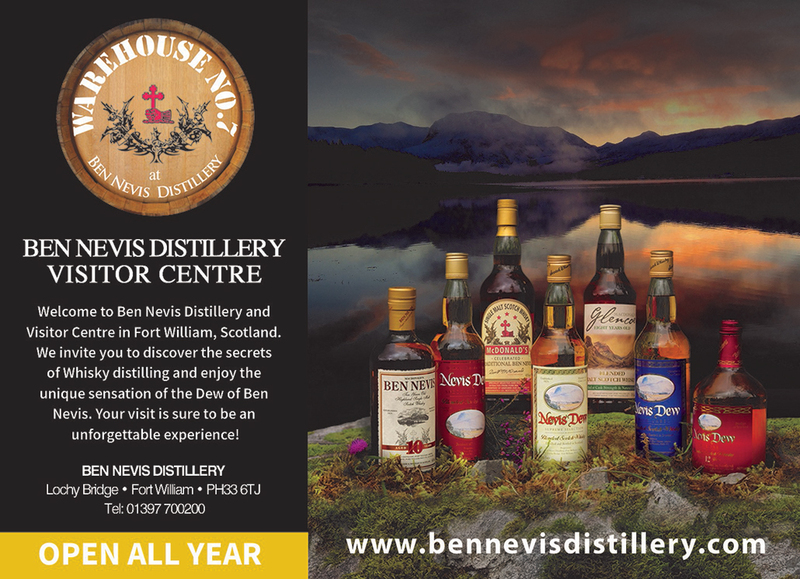 Incorporated within Ben Nevis Distillery is The Legend of the Dew of Ben Nevis Visitor Centre, built into an old warehouse dating from 1862 and former bottling hall, which still retains some of its original features. In the visitor centre you will encounter the mythical giant Hector McDram who will reveal the Legend of the Dew of Ben Nevis in a specially commissioned audio visual presentation. After your experience with Hector, a conducted tour of the production areas by a trained guide concludes with a complementary ‘tasting’.